There are going to be mild Sengoku Basara: Judge End (Sengoku Basara -End of Judgement-) spoilers throughout this entire post because it's difficult to talk about the latest magazine coverage without them. Please be warned. I received my shipment of August anime magazines yesterday, so it's time for the usual roundup of Judge End promotional news. There's less than usual this month, in part due to the new Kuroshitsuji (Black Butler) television which is dominating the mainstream anime media right now (thankfully, I'm a fan of that series too). First is Monthly Animedia. 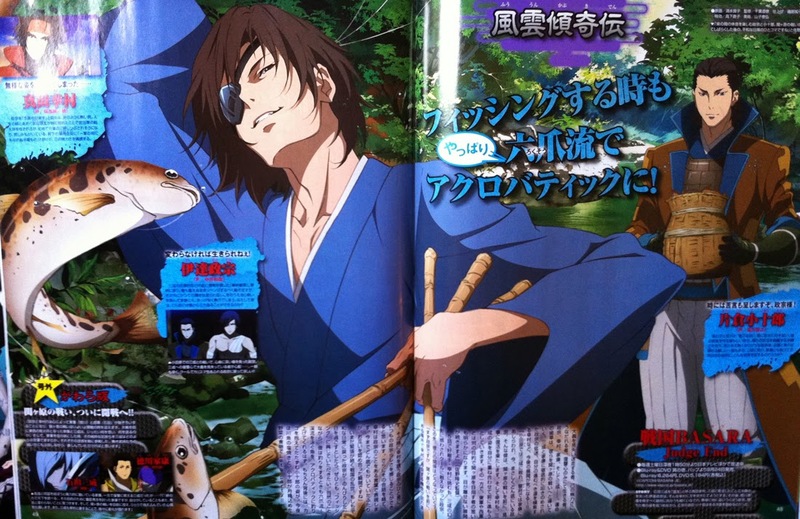 There's no new information in the two-page article, but there is a very entertaining illustration of Masamune relaxing by going fishing. Naturally, he's adopted his signature six-claw style. There's a lovely fan art of the four Judge End leads drawn by Asakura Yuri in the gallery, too. The television listings confirm the episode titles for the next few episodes of the anime. We already knew the first but I'll include it anyway. The series will not be broadcast on the weekend of 30th August. 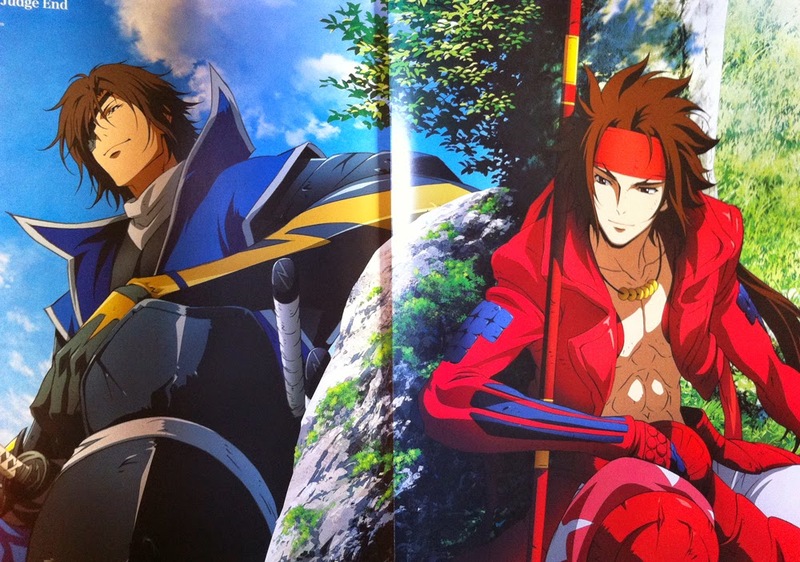 Moving on, Animage magazine has devoted itself wholeheartedly to Masamune and Yukimura this month. The pull-out poster of the two of them relaxing is accompanied by a four-page article, including a lengthy interview with seiyuu Nakai Kazuya (Date Masamune) and Hoshi Souichirou (Sanada Yukimura) on 'the growth of Azure-Crimson'. As the one playing the role, Hoshi relished the fact that this Yukimura is different to the way he was portrayed in the previous anime adaptations. The second half of Judge End will show a much more developed Yukimura than we've seen in the past. Hoshi doesn't think that Yukimura would have become the person he is without having had Oyakata-sama in his life. He's been fighting for his master's sake rather than his own, and his loyalty is unshakeable. Nakai believes that people who already know Masamune will enjoy seeing him get back on his feet again after his hardships, but he's anxious about what brand new fans will think when they see him going up against major setbacks right from the start of Judge End. He wonders whether they'll ask why the guy whose name comes first in the credits is such a bedraggled loser. The two seiyuu discussed the challenges of Masamune's quirky English vocabulary, and Nakai admitted that when he tries to imagine what foreign viewers might think it makes him weep. They joked about how odd it was for Masamune to react by exclaiming "Ouch~!" in the series instead of using a more natural Japanese equivalent. Hoshi thinks it's interesting that in times of trouble, the sunny Yukimura turned to Mitsunari, who is like a shadow. At the same time, when Masamune's feelings took a darker turn he went with Ieyasu - who is like the sun. He finds the contrast fascinating. Even Nakai was a little shocked when Kojuurou suddenly came out and called Masamune 'Bontenmaru' in episode five. Both actors loved the scene at the end of episode four where Yukimura stands up to the revenge-driven Masamune and stops him. As for other characters, Hoshi is interested in Kuroda Kanbee, who doesn't interact much with Yukimura in the games. Nakai said he's amused when he's reading the script and Koyama Rikiya's voice comes drifting out. They joked that Tsuruhime was a little out of place whereas Magoichi's cool attitude fits the series perfectly. Still, Hoshi likes Tsuruhime's comical antics. Yoshitsugu's underhanded scheming seems to cause a lot of fooling around during recording tests in the studio. Nakai observed that there's nobody in this series who speaks 'normally'; the recording puts a lot of strain on the actors' voices. Hoshi noted that a relatively normal-sounding character was added for Sengoku Basara 4, but as this series is based on Sengoku Basara 3 there's just a bunch of noisy guys. There's a 'homemade' feel to the recording sessions. There's no need for any extras because once they're done with their lines the actors record the 'crowd' sounds. The individual actors might each voice hundreds of regular soldiers; it's impossible to keep count. People are surprised to hear Nakai being cut down or standing in the enemy's ranks if they listen really closely. When asked about what they'd like to see if a new character was introduced, Hoshi said he wanted to see them reveal a foreign warrior who could chat with Masamune. Nakai countered that they'd have to be an English speaker or it would be pointless, then joked that Masamune would probably go silent in front of an actual native English speaker like a stereotypically shy Japanese person. Hoshi said he would much prefer to see Masamune effortlessly speaking fluent English (with the imaginary foreign warrior character); in fact, that would make him respect Masamune even more! Nakai wasn't so sure he wanted that kind of respect. Another question asked who they'd like to have as their commander if they were warriors themselves. Hoshi said he'd naturally choose Ieyasu; if a subordinate betrayed him then Hoshi could go and tell Ieyasu "My Lord! Someone has betrayed you!" without having to worry about being killed. When Nakai commented on the way Mitsunari did this in the first episode of the anime, Hoshi said that Mitsunari should really have apologised to that poor soldier since it was all a misunderstanding. Nakai joked that Mitsunari was really terrible. Continuing, Hoshi said he wouldn't be able to fight for Mitsunari without living in fear because he might slay someone for a simple misunderstanding. On the other hand, if Ieyasu even wants to form bonds with his enemies he's likely to have a close relationship with his own troops. Hoshi's argument seemed to convince Nakai that Ieyasu's army was the best too, though he drew the line when Hoshi suggested they both surrender and join Ieyasu together. Aside from Ieyasu, Nakai thought that Shimazu Yoshihiro might be a good choice; he seems nice and his territory would be good for vacations. 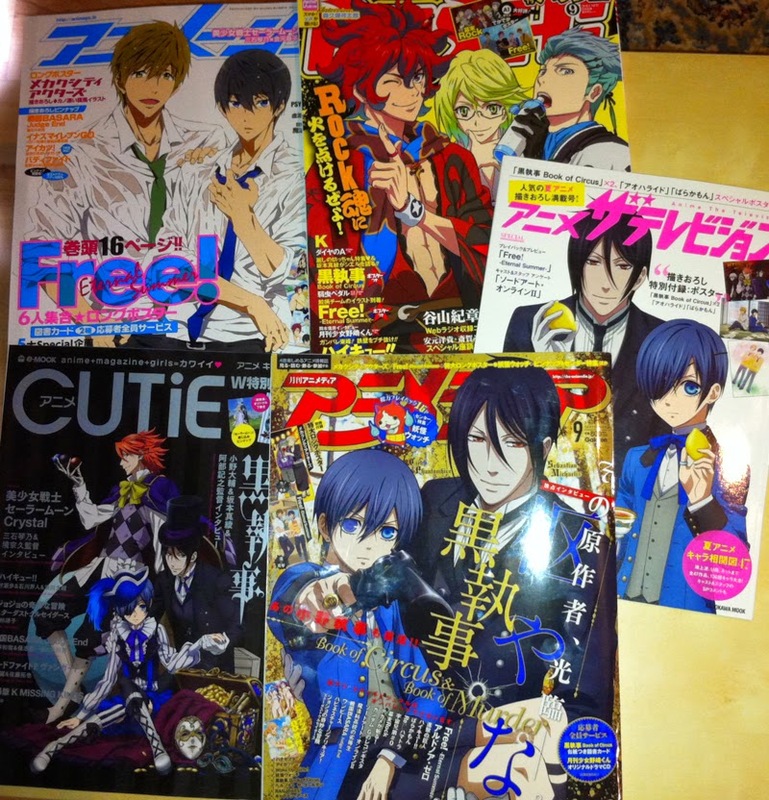 Monthly PASH! has the weakest coverage this month with a two-page article full of screenshots. It's saved by a short interview with anime producer Itou Kouhei. When asked for some behind-the-scenes gossip on the characters, Itou refused on the grounds of wanting to avoid spoilers. Instead, he talked about some of the minor changes that were made during production. In episode two, Motochika was originally supposed to cry out to his fallen men with 'omae', a characteristically rough way of addressing them, but it was changed so he called out to them by their names instead: Shige, Bekunosuke and Yasubee. This was intended to convey his feelings better. Sourin's castle was tweaked to give it a more western-style design. The story will advance more quickly towards the Battle of Sekigahara now that Masamune and Yukimura have been revitalised after what happened in episode six. Itou recommends observing the changes in the emotional states of Ieyasu and Mitsunari as the 'war which divides the country' approaches. In place of the previously-disappointing Newtype and Otomedia (which isn't published this month), I picked up two completely different magazines. Kadokawa recently produced a special mook with coverage of this summer's anime titles called Anime The Television. It is plainly aimed at female readers and includes four pages of Judge End coverage. The article's main attraction is a pair of interviews. The first of these is with director Sano Takashi. Before being asked to direct Judge End, Sano had heard of the series before by name but never played any of the games. When he subsequently decided to try the games, it was the individuality of the characters and the exhilarating sense of action which left an impression on him. The interviewer asked him whether his impressions had changed after working on the series as a director. Sano said that from seeing the existing stage plays and games he'd felt a glamorous festival-like atmosphere, but with Sengoku Basara 3 each of the characters has a very dramatic story which gave it a more plot-heavy focus. Although this is the third animated television series based on Sengoku Basara, it's the first one for Sano and his team. They intentionally tried to create the world of Judge End without being trapped by trying to adhere to the previous adaptations. The interviewer asked whether they kept the game's large female fan base in mind, to which Sano answered that they didn't especially think about targeting female fans. However, they tried to include as much familiar content as possible outside of the anime-original elements. The first episode was surprisingly intense. They want to keep the sense of haste up throughout the series to focus on the story's final destination of Sekigahara, and place importance on each warrior's individual drama. Sano's favourite Sengoku-era commander is Kobayakawa Hideaki because he wants to eat delicious food. He ended the interview by repeating something from a previous article where he explained that each episode builds on the last in a careful arrangement, so it's important to watch them all now that the countdown to Sekigahara has begun. The second interview is with seiyuu Hoshi Souichirou (Sanada Yukimura). Asked to describe the series, Hoshi answered that it's a history textbook; he's been involved with the series for almost ten years at this point and the real Sengoku era has become Sengoku Basara for him. He quickly added that he was half-kidding (yet at the same time, half-serious). Over such a long period, his feelings about playing Yukimura haven't really changed; he's still hot-blooded, youthful and straightforward. However, he thinks that the physical aspect might eventually become harder since he still wants to keep playing Yukimura for a long time. Asked which characters he likes besides Yukimura, Hoshi first answered Masamune, Kojuurou, Ieyasu, Mitsunari, Sasuke and Shingen...then gave up and said he liked just about everyone in the series. He said that he thinks that Yukimura's rival, Masamune, was the perfect 'hero' for the original Sengoku Basara game. He's a great guy whose central position in the series for these ten years has been absolutely essential. As for his favourite real-life Sengoku-era warrior, he's actually fond of Date Masamune. The drama shows he watched as a child left a strong impression on him and they're both from the Touhoku region. He can relate to the real-life Masamune's 'can-do' attitude. Hoshi urges people to experience the shocks of Judge End for themselves, saying that it's unlike the 'Basara' which came before it. To help draw attention to the article there's a large illustration of Masamune and Yukimura fighting. 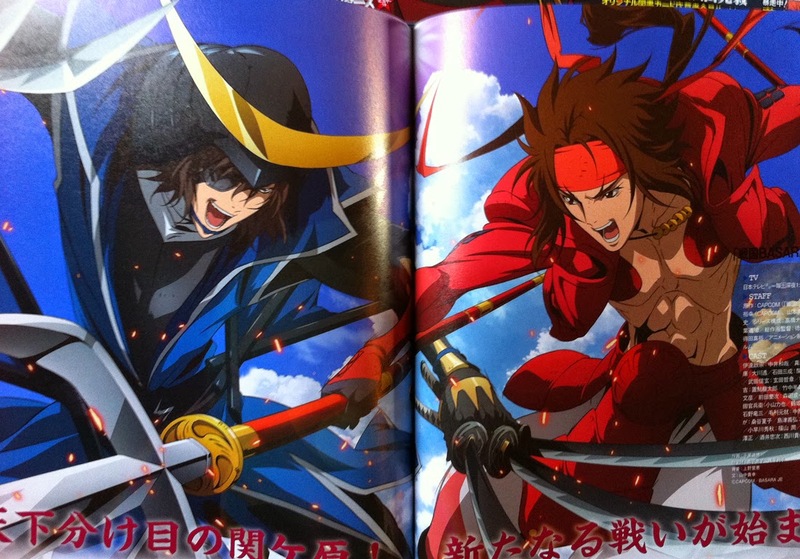 Not to be outdone, Takarajimasha also have four pages of Sengoku Basara Judge End content in their 'e-mook' Anime CUTiE. It's another thick, colourful magazine aimed at girls and despite its title it includes a little game and manga coverage to complement the anime. The Judge End article takes the form of three very short interviews with seiyuu Nakai Kazuya (Date Masamune), Hoshi Souichirou (Sanada Yukimura) and Ookawa Tooru (Tokugawa Ieyasu) alongside an ad for the Sengoku Basara 4 Special Package rerelease which came out last month. Nakai is delighted at the chance to struggle with Masamune again; it's an exhausting role which completely drains him. It makes him sweat; he has to yell much more than he expects. The sweat is both great and unpleasant at the same time. Hoshi went into the recordings a little worried about what would happen to Yukimura with the anime-original content, but now he can't help feeling excited. In a message to long-time fans of the series, he declared that he hoped Yukimura would 'follow Masamune anywhere!'. Ookawa is excited at the prospect of a brand new production team being able to show the fans a whole new 'Basara' as it's been a while since the previous adaptation. He's looking forward to them showing what Ieyasu is like inside, which hasn't really been talked about much up until now. The interviews really are very short so that's the best I can do! 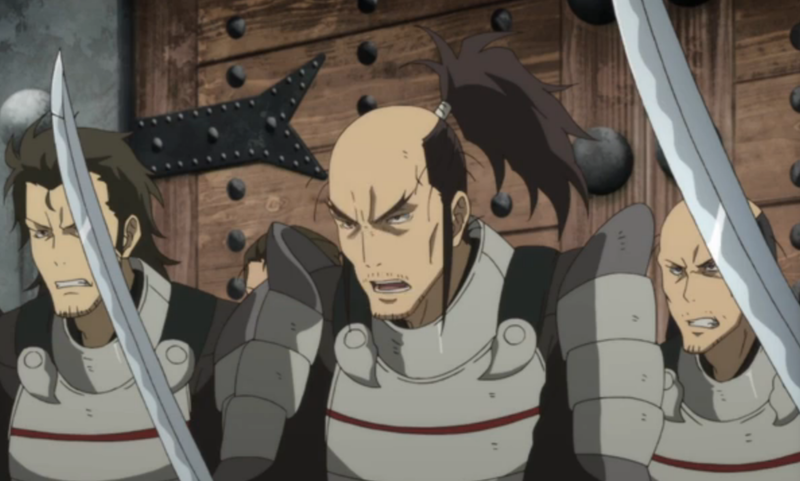 I got excited the other day when Isono Kazumasa was added to the official character roster on the Sengoku Basara: Judge End website but I have since rewatched episode five, where it turns out he was credited already. I think he was the angry Oda soldier pictured below - presumably he'll be showing up again in future! The last piece of Judge End news for the day is that it's been confirmed that Morita Masakazu (Maeda Keiji) will be the seiyuu guest for the bonus radio CD included in the third volume of Sengoku Basara: Judge End on DVD and Blu-ray. Thanks so much for the info and the translations! "He wonders whether they'll ask why the guy whose name comes first in the credits is such a bedraggled loser." Well... The people I know who watch JE without having known Basara before think that so far Masamune is an obnoxious brat (and wonder why Kojuurou even puts up with him), Yukimura is depressing (one of them suggests that Kojuurou and Sasuke should just elope and leave their masters to fend for themselves as a way of building character :D), Ieyasu is a hypocrite, Motochika is kind of stupid, etc... I guess the characteres really don't come off well on their own. "Even Nakai was a little shocked when Kojuurou suddenly came out and called Masamune 'Bontenmaru' in episode five." That was so surreal, especially with the lack of keigo. I half-expected him to send Masamune to bed without dinner, or to tell him to stand in a corner and think about his behavior. ^^;; This is, again, one of those scenes where I understand what they were trying to do but can't help feeling that it doesn't really come off the way they intended... Really, Masamune, you're how old now? stop making Kojuurou treat you like you're five. "There's a 'homemade' feel to the recording sessions." That's a polite way to put it! :D I find the main seiyuu doing walla rather distracting (I guess it's a bad habit from my days at a dub studio), especially since so many of them have very characteristic voices. "Hoshi went into the recordings a little worried about what would happen to Yukimura with the anime-original content, but now he can't help feeling excited." "he hoped Yukimura would 'follow Masamune anywhere!'." Hoshi seemed to be in very good spirits in the interviews; he's so sweet and mischievous. I hope that the characters will recover from their setbacks swiftly now that they've all made their minds up about which side they're on (if any of the new fans are still watching to see it ;_;). Aside from the conversation about the episodes, there are some well-known and not so well-known characters that doesn't seems to appear in Sengoku Basara Judge End as of yet, which are Yoshiaki Mogami, Toshiie Maeda and the rest of the 6 area warlords. Yoshiaki is unlikely to appear, alas: I'm not fond of this character, but the writers tend to load Tenkai with too many captive women. Many information, thank you as always for the efforts you put in keeping us informated! Well of course a new production based on SB3 (we all know were many routes go to) but with some original script, i'd feel anxious too about my character XD Well its always glad to know all the efforts that they put in dubbing our beloved characters. Why the foreigner warrior should speak english only to Masamune? Pretty much everyone understand what engrish is XD Good illustrations too. Finaly we will know more about Ieyasu's inner conflict and true nature (not that now he is not himself but rather now he's acting accordingly to his dream). Really like the comparison between the opposites: the hyperactive Yukimura with the creepy Mitsunari and depressed Masamune with Mr bright as sun. Can't wait for the next episode. It's not long until the next episode now! There aren't many left; it's going to be sad when the season is over. I'm looking forward to finding out what will happen tomorrow!